This work is devoted to the methodical support of composition diagnostics of near-surface layers, thin films, and layered structures with interfaces by Auger spectra in the course of ion profiling. 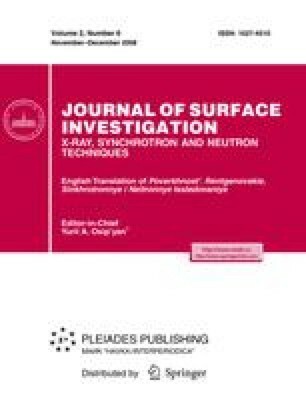 Two alternative approaches used currently in diagnostics, elemental and phase analysis, are compared by an example of objects of the known phase composition, which are buried cobalt disilicide layers in silicon. Contributions of the ion sputtering, primary electron beam backscattering, generation and escape of Auger electrons are considered. Original Russian Text © V.G. Beshenkov, Yu.N. Parkhomenko, D.A. Podgorny, E.A. Vigovskaya, O.V. Toropova, 2008, published in Poverkhnost’. Rentgenovskie, Sinkhrotronnye i Neitronnye Issledovaniya, No. 11, pp. 69–72.